Thurman plays Raffie, 37, who is recently divorced and regularly sees her shrink (Streep) for support. She finds love again with a younger man and confides in her shrink who, ironically, has a connection with her new guy. The older woman/younger man story should get more of a run. But truthfully, she should have nipped this one in the bud when she had the chance. I mean, what did she think was going to happen – he’s 23! Streep is excellent as usual, but she can’t do the whole thing solo. I didn’t mind this movie once, but never watch it twice – it moves way too slowly. 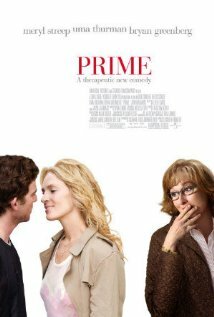 Posted on 12/07/2011, in the whole rom com list and tagged Bryan Greenberg, Meryl Streep, Uma Thurman. Bookmark the permalink. Comments Off on Prime.